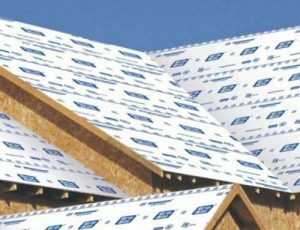 The only roofing underlayment with the high performance of a synthetic underlayment, and the finished look of a shingled roof. 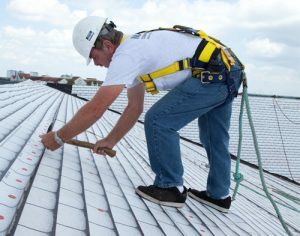 Available in energy efficient white or tan, ShingleLayment® outperforms felt, is installer friendly, and provides both durable temporary cover and long lasting water shedding protection. 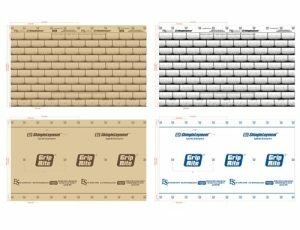 Grip-Rite® ShingleLayment® synthetic underlayment is a lightweight, woven polypropylene underlayment coated with a non-skid TPO. ShingleLayment possesses very high tensile and tear strength that resists tearing, ripping and blow offs from high wind exposure. 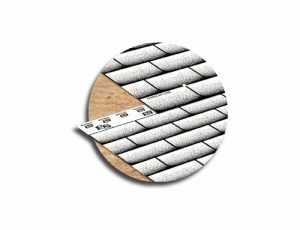 ShingleLayment can be used in any code compliant mechanically attached roofing application. Grip-Rite ShingleLayment synthetic underlayment is used on steep-slope roofs beneath shingles, battened tiles, metal roofing, slate, wood shake & shingle, and simulated slate/shake prepared roof coverings as an alternate to ASTM D226, Type I or II or ASTM D4869 asphalt felts. 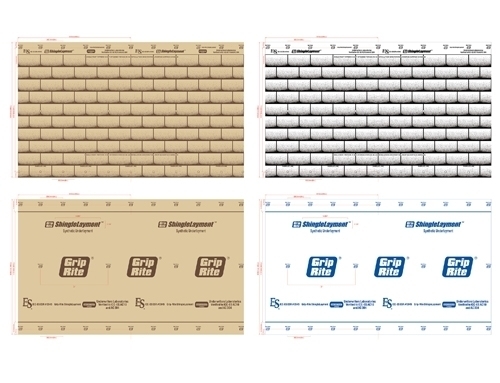 Grip-Rite ShingleLayment synthetic underlayment is a water shedding device designed to reduce the occurence of leaks caused by wind driven rain penetrating primary roof system coverings, as well as damaged roof coverings, and as temporary cover on exposed roof systems. Grip-Rite ShingleLayment synthetic underlayment is available with standard installer print pattern or exclusive shingle-look print pattern (Patent Pending). Both print patterns feature installation and nailings grids for easy, accurate application. 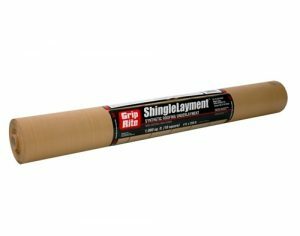 Grip-Rite ShingleLayment synthetic underlayment increases applicator productivity thanks to its low weight per roll, and superior 10 sq. roll coverage. Grip-Rite ShingleLayment synthetic underlayment can be exposed to natural UV for up to 180 days. Severe weather, jobsite damage, chemical exposure or other conditions may shorten exposure life. 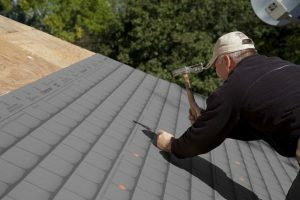 Shingle print pattern provides a unique finished look to exposed roof surfaces. Patent pending. Titanium dioxide white coating provides an energy saving emissive layer that reduces heat penetration. Tear resistant high tensille strength woven PP substrate that does not distort or belly like spun-bounded sheets. More than 5 times lighter than 30 lbs felt. Roll coverage is 4.6 times greater than felt. Non-skid TPO coating with high coefficient of friction. Printed nail pattern for easy installation. Available in two energy efficient colors, white or tan. Lighter colors reduce fabric cycling (expansion and contraction) thus reducing nail hole elongation.